The Victorian era was a time in which Queen Victoria was reigning as the monarch of England. While a huge growth may sound like a very promising time for the country as a whole, the process in which in occurred was extremely difficult. According to statistics, England almost doubled in size within a short fifty years. Where do you think all of these people were held? Generally, undertaking an additional 13 million people in such a short period of time meant that there were a lot of side effects to such growth. This was at the heart of the industrial period, so not only were the people who normally lived in the countryside making their way to the large urban cities, but immigrants were also coming there too for work. What ended up occurring is that often multiple families would live in the very old places throughout the city. They would cram into small places. Still, there were many families and children who were left without homes. The cities and streets of London were filled with people who had nowhere to go. Typically, in urban areas where there are too many people and lower income you will find lots of crime. This was also the case throughout the urban places. Generally, you would find many prostitutes and theft throughout the city on a regular basis. These types of crimes were normal for people who were trying to stay alive. The city streets themselves were covered with sewage. 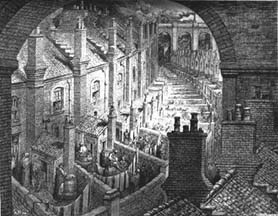 With severe over-population for the majority of the Victorian era, there was no sewage system within the city. It wasn’t until the end of the era that sewage was more properly dealt with. Unfortunately, this caused diseases and illnesses to spread rampantly through the large communities. It was stated by statisticians that the average life expectancy of a young male would be 25 years old due to their horrible living and working conditions that they were placed in. Many young children died and those who did not, barely survived.